​Whoever you are, you’re a child of God. We welcome you to join us as we live into this mission statement to serve all God’s children and their families. 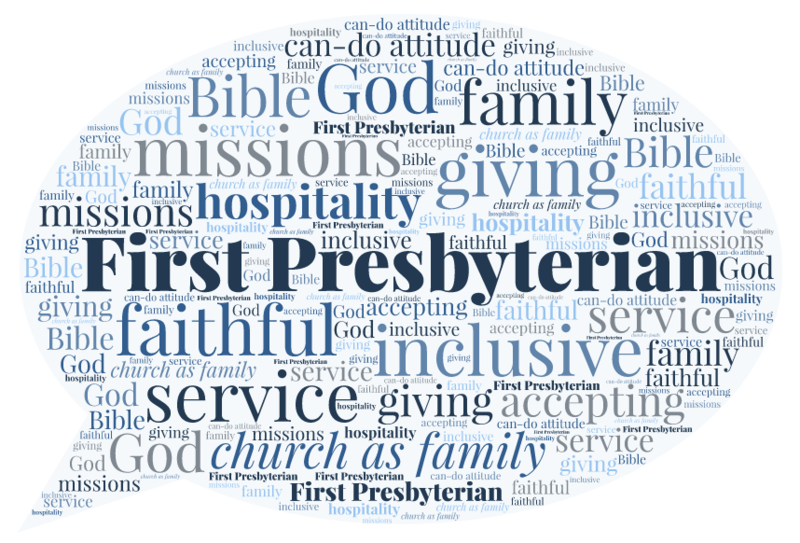 The friends and members of First Presbyterian Church are called by God through Jesus Christ to renewal, spiritual growth and service. ​All are accepted, loved, and cared for in a Christ-like manner. As followers of Jesus Christ, we are called to participate in God’s mission to the world, ministering to the immediate needs and hurts of people and reforming those structures and systems which create or foster brokenness and injustice. Sunday School (All Ages) - 9:15 a.m.
Worship (Intergenerational) - 10:30 a.m.
Coffee Fellowship - 11:30 a.m.
Nursery provided for infants through 2 years old. ​at the corner of Pleasant Street and Lexington Avenue. Meditation Garden, open to the surrounding community.